College dorm life can be a bit rowdy at times. You may not be able to sleep during the times you want to sleep, and you may need to be awake during the times you should be sleeping. This is a problem for all college students. That's why this Sleep Shade & Ear Plug Set is a college necessity. This dorm room product Sleep Shade & Ear Plug Set will help you snuggle into your own little quiet world when you need to get some shut eye. Without it, you are left at the mercy of others' schedules and cruel daylight. Add this Sleep Shade & Ear Plug Set to your college stuff and enjoy hours of peaceful rest. 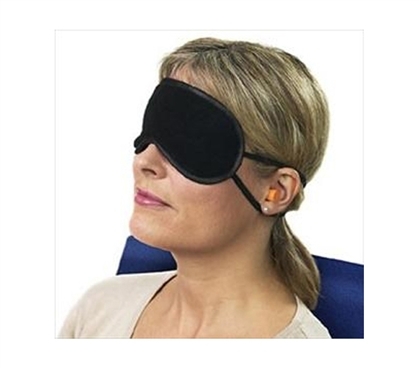 with this Sleep Shade & Ear Plug Set, you get to block out sound and light whenever you want to slip into sleep. This dorm room accessory Sleep Shade & Ear Plug Set is a college must have!